The Salisbury Business Center is hosting a new art exhibition featuring photography and digital art by local artist Duane DuVall. 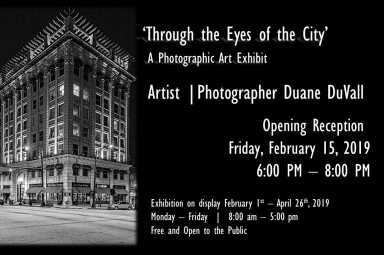 The exhibit, ‘Through the Eyes of the City’, will run from February 1st through April 26th, 2019 and is available for public viewing from Monday – Friday 8:00am-5:00pm. With lens in hand, photographer Duane DuVall purposefully sets his story in the city, and in doing so, invests it with a very real sense of dignity. DuVall composes a vivid portrait through the art of photography that, rather than a morose depiction of inner city living, seeks optimism in the generational renewal of street corners and tucked-away alleys, a far straighter interpretation of hometown North Carolina than brush or prose. DuVall’s buoyant compositions proffer a sense of an artistic outsider welcomed by a town bearing the patina of its rolling historic past. His photography manages to capture a specific feeling familiar to city dwellers: the idea that the city is an overwhelming abyss, but simple pleasures — be it the stability of a park bench or a night walk along a downtown sidewalk — can save you. 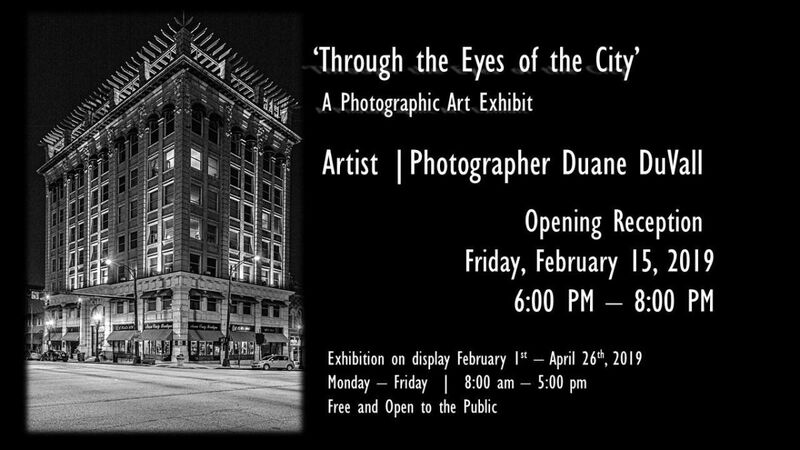 With the new exhibit at the Salisbury Business Center, “Through the Eyes of the City” – February 1st through April 24th, DuVall pays homage to the city with a less-is-more approach, and takes the viewer to a place that inspires strong reactions, allowing people to project their own city experiences into his view. There’s an intangible, intoxicating power to DuVall’s personal history with the city that he captures so well. The larger theme is one that applies to life in any city: the struggle of being there can be, in part, the promise of tomorrow’s opportunities. Visit Duane DuVall Photography at ddphotography13.com or on Facebook at www.facebook.com/multimediaartsbyduaneduvall. Each work of art featured in the ‘Through the Eyes of the City’ exhibit is available for purchase, and the artist is the recipient of 100% of the sale proceeds. ‘Through the Eyes of the City’ is part of the ongoing Salisbury Business Center Art Partnerships Gallery Exhibits program, wherein gallery space is provided to local artists in order to promote area artists and to increase art appreciation within the community. To achieve these goals, the SBC sponsors art exhibits in four periods annually, free and open to the public. Visitors are invited to view the exhibit weekdays, Monday – Friday, from 8:00am-5:00pm.